This is the second book in the Veil Knights series by Rowan Casey (actually a pseudonym for 12 bestselling authors working collaboratively). The first introduced the Veil Knights, King Arthur’s knights who fought the forces of darkness, creating a veil to act as a barrier between our world and the hordes of monsters beyond that wanted to plunder it. 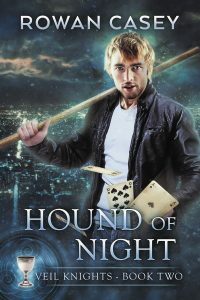 This second novel further expands the mythology and features a different Veil Knight as the protagonist – John Seton, a red-headed (or in his own words, ginger) Scot with a magic mirror in his pocket and some pretty mean skills with an iron-tipped quarter staff. The Veil Knights are on quests to recover magical artefacts that will allow them to maintain the veil and protect our world from the forces of evil. Seton has a fairly simple life – he plays guitar and sings in a Scottish pub in Los Angeles, as well as using his basic magical talents to play Hide the Lady with tourists, conning them for extra cash. 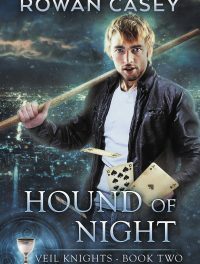 He now seeks a magical leash, and finds it in the hands of a local mobster with a penchant for Scotch whisky and all things arcane. Like the first novel, this is a definite page-turner – the action flows thick and fast, and the author(s) include lots of great mythology, from King Arthur to the Norse Three Fates, to even a mention of the Hermetic Order of the Golden Dawn.